Today was the day for Uluwatu, venturing even further south. Uluwatu is famous for rich couples and rich families staying at cool resorts, with nothing much else around. But many places also claimed it had the the nicest, most peaceful beaches around. And scenery in general. For some reason, even though I felt so unwilling to go and hang out with monkeys in the Monkey Forest of Ubud, it didn't seem such a bad idea to visit the Monkey Temple of Uluwatu, mentioned somewhere online as 'notorious' for its evil monkeys ('evil' in both the sense that they had the distinct possibility of carrying rabies, as well as an even greater possibility of being a thief whose talents exceed even the most skillful Vietnamese human pickpocketers). 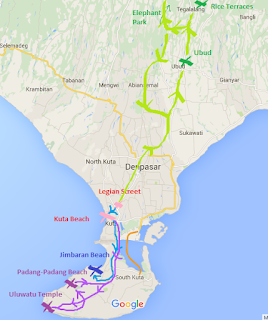 We left Kuta southwards, past the airport and past Jimbaran, into more hilly scenery. After about half an hours drive google maps froze so we had no directions... “We're in the middle of nowhere,” Nikki commented hintingly after quite a long time of 'aimless' driving, or well, following that one road. “A few more kilometres,” I promised her, not completely believing in myself. But, I turned out to be right! Our road ended at some templey looking place which turned out to be The Templey Place! In the end, South Bali is no Saigon – there was one 'main' road (and let me show you a pic of the mainness of it...), there was hardly any way you'd go the wrong way unless you literally drove into a rice field. We got stunning purple sarongs (sarongs?) which seemed pretty pointless because, with some people, they covered less than their own capri trousers. I asked the ticket dude if it was safe to take my bag in or if the monkeys would take it, and he was quick to offer his services as a monkey guide for 100,000. Erm, maybe not, though, ta. Not a monkey in sight! To reassure you, mumsie, the monkeys were not bad at all. And there weren't even many of them. They promised you that if a monkey did steal something off you, you'd get it back. But it's not encouraged to distribute your stuff willy nilly to them (I exaggerate) because they have to be bribed with fruit or other goodies, providing them with an unintentional 'prize' for stealing that object. And the temple itself? Well, I can't honestly say much about the temple itself – you weren't allowed in, and to be completely honest, for me, it wasn't that much about the temple. It was about the views. Now let me tell you something. 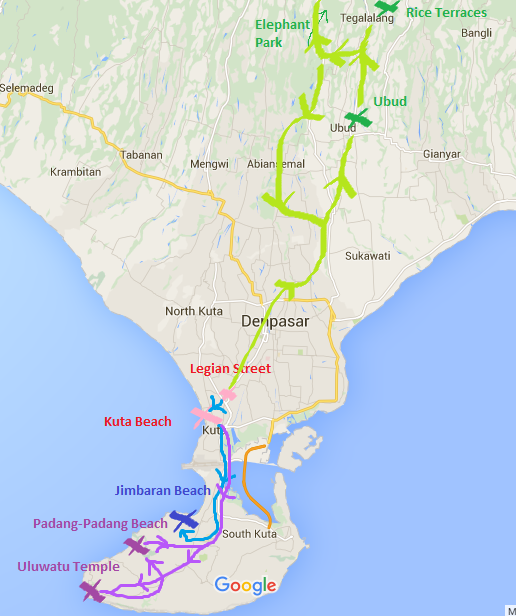 Especially rereading my previous entry about Jimbaran, I didn't sound massively enthusiastic about any of the scenery. The thing is, everything we saw in Bali was beautiful. Of course it was beautiful, it was Bali! My expectations were very high, much higher than I think anywhere else I've visited. So, it's hard to completely appreciate the sheer beauty of it without thinking “well, is this worthy of the word paradise?” (which it often, actually, wasn't) So, like Jimbaran beach yesterday, had it been on our Malaysian holiday, I would've praised it no end. But, it's Bali. You'd hardly expect a dump. BUT ANYWAYS. Uluwatu Temple was probably the best scenery I saw on the whole trip. It was BREATH-TAKING. The ocean, so vast, so BLUE, and the waves that I've so often described so poetically as WIDE and POWERFUL (note sarcasm with the word choice of 'poetically'... but it's true!! They were wide and powerful!!). And this temple hanging on a cliff. A stunner. After sweating enough at the Monkey Temple, we awoke google maps from the dead and decided we'd venture onwards to the closest 'beautiful beach' (according to various travel sites as well as one of my favourite bloggers who visited Bali back in 2012), Padang-Padang. It was beautiful. Like, absolutely stunning. Just take away the tourists. We were superhungry so went to sit at this dodgy-looking eating hole where the table was seriously leaning so much that we were hesitant to put bottles on it. However, the food was surprisingly scrumptious and the restaurant ladies sincerely friendly and nice! I expanded my Ozzie culinary knowledge (yes, Bali is very Ozzie, if you haven't gathered by now) and had a jaffle, a toasted sandwich which was very nice! And Nikki's chips were home-made - they were still potatoes when we ordered. So, Padang-Padang was beautiful, but once again, as we'd been pre-warned to be fair, it was not a beach to swim at. The best bit of Padang-Padang was venturing over the jagged rocks onto the more uninhabited areas of the beach. Such a long beachline, absolutely beautiful. Now this was Bali. We even saw more monkeys – wild, unadvertised ones! Another fave pic: monkey, surfer, beach. Parasta. Some were even carrying babies!! But then they became more and more numerous, and started hissing at each other, so we left the scene. Then, it was time to go 'home'. Possibly the best day. I LOVE driving (riding... but it still sounds weird to say riding. It's a bike, not a horse) Bali streets, especially in the more rural south. Uluwatu Temple was a definite positive surprise, and Padang-Padang beach fulfilled them paradisey Bali beach expectations. A stunning day. Upeita kuvia todellakin! Saa hyvän käsityksen siitä, kuinka ainutlaatuisessa paikassa olitte. Kiitos, kultaseni, että rauhoitit minua niiden apinoiden suhteen. Säikähdin vähän, kun aloin lukea tätä blogia, kun uskoin, että olitte jättäneet jo apinat taaksenne. Onneksi selfiekuvaaja poistui, ettei niskasi vallan vääntynyt. Ja tuloksena oli mahtavat kuvat!